Wow, I can't believe it's right around the corner. What I really can't believe for the first time ever my life doesn't feel completely engrossed by it, cha-cha-cha-changes. and I'm thinking this Marley Lilly hat with a blue monogram. I've got a little more time to figure things out for Kentucky, LSU and FL GA. 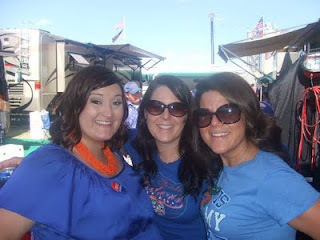 Even though I'm helping to plan the DC Gators road trip to Kentucky, it's still 50/50 in my book. If I can convince Josh that we need to take an extra day on the way to Lexington to stay at the Greenbriar, it may move higher on my priority list-ha! To get into the spirit, I wanted to share this little number, also seen first at Copacetic in Carolina. Of course they picked the TACKIEST Florida fans, but hey it is what it is. 1. Where'd you get that great orange necklace in the first picture? 2. I can't wait to watch that fan docu! 3. I don't think we're going to ANY SEC games this year. We're overdue for a trip to Blacksburg, so that will probably be the only place I get to spend a football Saturday! Hoping we can meet up in the Burg. We shall see! Thanks Sarah for the gracious link love :) I think every SEC fans is going to love the full documentary once it's released! I said it's great to be a Florida GATOR! You are too much! I hope the sickness is left behind in the 1st trimester, it did for both my pregnancies. I know that weird feeling of never feeling right. Hang in there about not feeling like a great parent. You already are! The most important thing is a healthy baby & everything else will fall into place. Ahhh i LOVE marley lilly!! I have the same hat, but in pink trim w/ navy (the one pictured on the www is mine :) and im OBSESSED. Folds up nicely and takes is shape back immediately. i am so excited about football. It can't get here soon enough.